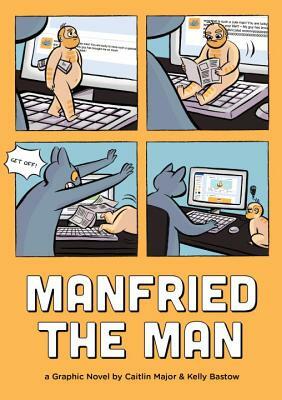 Named one of Paste’s "25 Best Comic Books of 2018"
Meet Manfried, a stray man taken in by the likable but introverted tomcat Steve Catson. Stuck in a dead-end job and bemoaning a nonexistent love life, Steve depends on his pet man for friendship and support. But when Steve’s carelessness results in Manfried getting lost, Steve has no choice but to muster his meager resources to bring his best friend home safe. Can a cat who can’t even clean up his own apartment manage to find his missing man before it’s too late? In an all-new series based on the wildly-popular tumblr webcomic, classic comic strip layouts and colorful cartoon art make this a fun read. It’s a great gift for comics fans, pet owners, cat lovers, or anyone who appreciates a story full of humor and adventure, with a sweet friendship at its heart. Caitlin Major, creator of Manfried, is a Toronto-based comics writer and illustrator. Her webcomics include Home Sick, Peach Plum Pear, Yer a Witch Milly, and The Spirit and the Spider. Caitlin works as an animation compositor at Skyship Entertainment, an animation studio in Toronto that specializes in kids’ programming. Kelly Bastow is a comics creator and commercial illustrator. She illustrated Quirk Books’ The Fangirl’s Guide to the Galaxy and has drawn for the comics Lumberjanes, Adventure Time, and Capture Creatures. She self-published the graphic novel Wax and Wane (coloring by Caitlin Major), and her 2017 autobiographical comic, Year Long Summer, was nominated for an Ignatz Award.